Often good feedback is harder to come-by than negative, and so I believe when a service has been provided that exceeds expectation, it is important to communicate gratitude, in any language! Having seen the accurate translation and typesetting of our Dutch instruction manuals completed to such a high standard, I have to say how impressed I am. Body Clock Health Care is venturing into this new market and so standards need to be set high. The feedback from our New Dutch customers regarding the manual was excellent, no room for critique, paving the way for future business with confidence. 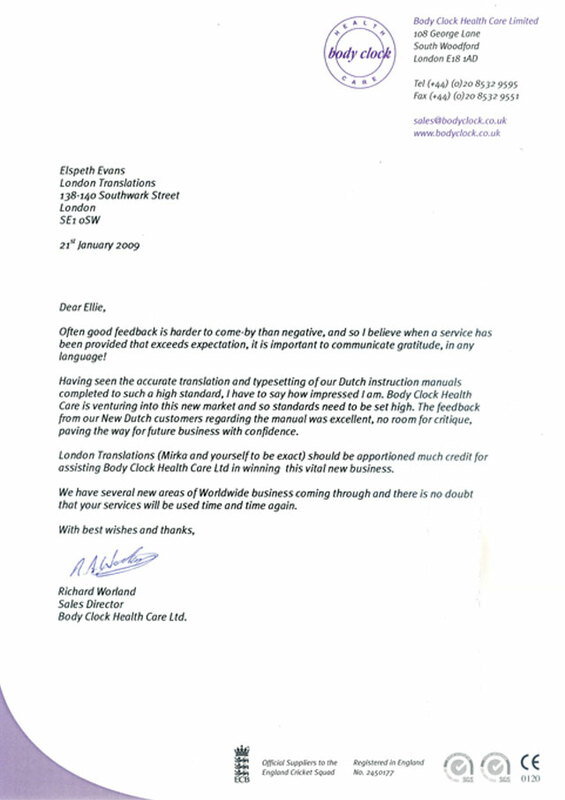 London Translations (Mirka and yourself to be exact) should be apportioned much credit for assisting Body Clock Health Care Ltd in winning this vital new business. We have several new areas of Worldwide business coming through and there is no doubt that your services will be used time and time again. Body Clock Health Care Ltd.